Shark hunters – hunt away! Having the boat surrounded by thousands of anchovies huddling along the hull, trying to avoid the toothy smile of several hungry bronze whalers, more than one mako and a whole heap of other wide-eyed fish on the feed – kingfish, skipjack, kahawai and snapper not far below. It's heart thumping adrenaline filled fishing when the switch is on out there in Autumn. This is peak season for many; big game, medium game and small game – right down to the tiny little white smelt that is causing a huge amount of ruckus both in the middle ground of the gulf and popping up around the edges. This is great news for land-based fishing and inshore kayakers. It's also fishing nirvana for offshore kayakers, like the Catch Pro Team, who take a mothership to outer islands, then set off in pure stealth mode in Jurassic Park-like surroundings at dawn and dusk armed with an array of highly lethal weapons. If you're after kingfish, the sharks like them a lot too, so it may pay to up the line and leader weight to get them to the boat a lot quicker – whole kingfish are better than just a head. Snapper are just getting into the autumn groove, slowly starting their need to feed before the inevitable winter slow down in a few short months. Some stunning mornings and evenings beckon for a quick inshore fish with a little light rod, a soft-bait and that's about it! 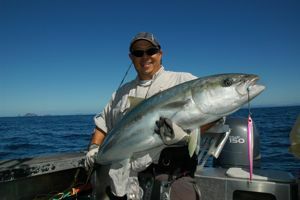 Those big kahawai, the ones that feel like a small kingfish on hookup are turning up randomly as they hunt their fleeing prey. Sometimes when they are eyeballing the little white smelt they, too, can be tricky to get to bite – so try going really small, say a 20gm micro jig or small white soft-bait, if you can. Skipjack are still around and so are the predatory striped marlin, between Little Barrier and the Mokes, for instance, if there's a flat day coming up, it could be just the ticket – a marlin from Auckland in a day could be great fun. If you can find a patch of water calm enough over the next few weeks, alongside the beautifully clear water and crisp cool air temps we're experiencing at the moment, it is an ideal time to throw down your chosen weaponry and hold on tight for a fish fight. Enjoy the magic of autumn fishing, you just have to be out there with a handful of lures and a rod. Easy.